CONSULT, DESIGN, BUILD AND PRODUCE Cado is your complete, one-stop blow molding and injection molding plastics facility — period. Cado customers’ products reach the marketplace faster, as we are the mold maker and the production facility, all rolled into one. 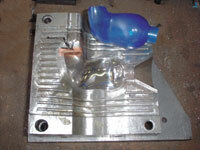 Since our inception in 1957, we’ve been on the forefront of blow molding technology. Today, we maintain our status as a top innovator in the industry. 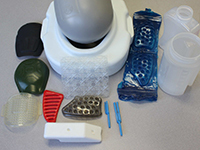 Whether it’s plastic-part design, consulting services, mold making or long production runs, our services are tailored to meet each client’s needs, and have been for more than 50 years. The past few years have brought two new companies under the Cado umbrella that diversify our custom work: Union Products and Fantazia Marketing. 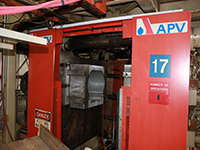 The acquisition of Union Products marks the continued production of Leominster, Massachusetts’ legendary Pink Flamingo, created by former Union President Don Featherstone in 1957. This iconic local and American symbol now lives on, right where it was invented — and has even evolved into a Zombie Flamingo version (for homeowners who are feeling brave). The traditional nature of Union Products items and excellent craftsmanship also spill over to the company’s other offerings: lawn & garden, holiday and seasonal novelty items. Fantazia Marketing is known for its fun, flagship products: the well-loved Giant Crayon, piggy banks and now-famous Ice Cream banks. The company’s other unique novelty items round out the scope of Fantazia’s offerings and further solidify Cado as a well-rounded, diverse operation. A decision to work with the Cado Company means your products get to market as soon as possible, with the best quality production, and with complete confidentiality — for less money. 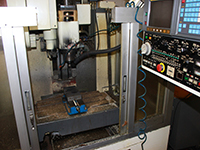 Our wide range of materials, equipment and expertise means we always meet clients’ tooling, deadline, capacity and time requirements. We take our customers’ projects from initial evaluation and recommendations to tooling development and fabrication, molding testing, careful sampling and finally to precision production. Because all of our production is done in house, capacity, specification and time requirements are never a problem. The system gets streamlined with Cado Company. Eliminating the involvement of many other firms reduces costs, shortens timelines and eliminates project management stress as the entire production phase is handled with a single, experienced vendor. However, you never lose out on the innovation side: Cado keeps up on the latest technology and equipment to ensure your project has all the latest benefits and selling features.